The address they give me isn’t the same as what shows up on a Google search. I arrive at a shabby Mexican joint. 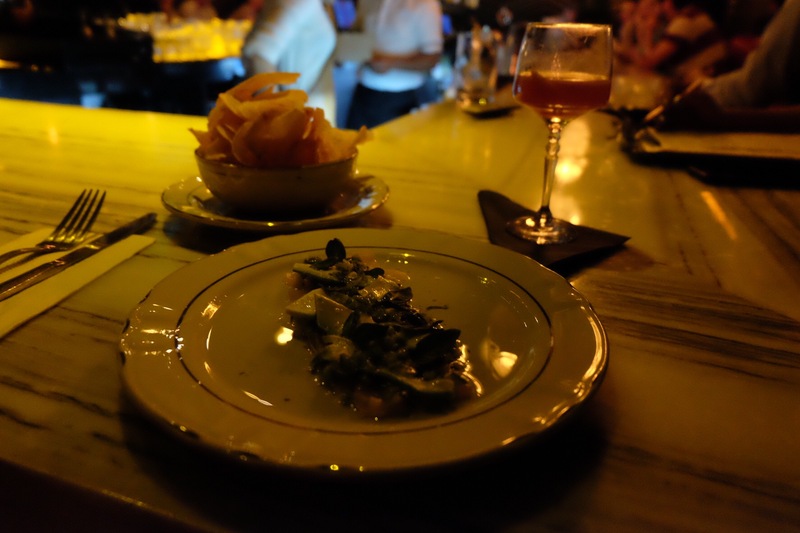 Brightly lit, there’s only a small bar-counter, a fridge of bottled beer, one communal table. At the opposite end, a couple sit, sharing a meal; they look up at me as I enter. It’s only the three of us, and then someone appears from the back, stepping behind the counter. “Do you have a reservation?” He asks, in English. “Yes.” I give him my name. He glances over a short, handwritten list. “Come with me,” a woman gestures. She’s wearing a teal velour 90’s slip dress and heels, styled for another world. From behind the counter, we squeeze through narrow swing doors, into a darkened corridor. The woman opens a second set of doors, pushing aside heavy drapes. Golden light illuminates the room: a small, dark square, stuffed with red, highback stools. Gilded mirrors crown the back bar, their international inventory glowing. 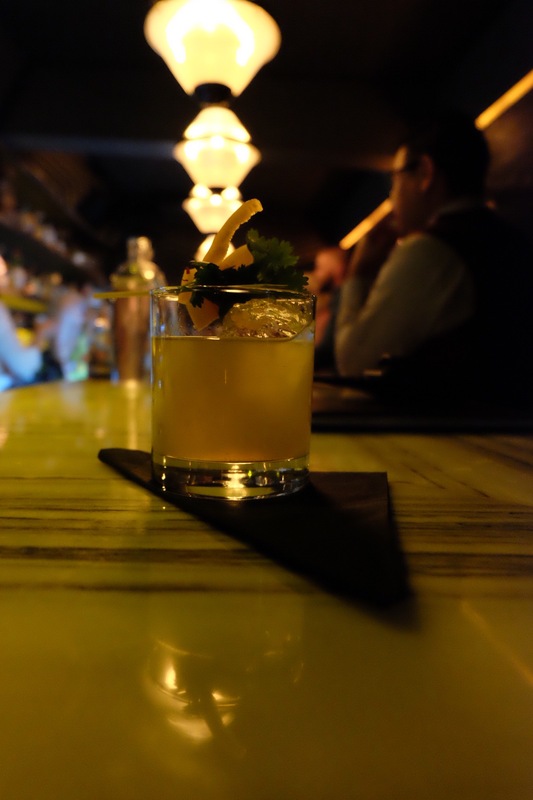 This is Hanky Panky, Mexico City’s elusive cocktail speakeasy, a reservations-only bar serving world-class cocktails in a still-hidden setting. My first drink, the Waterspout (amaro di angostura, strega, romate manzanilla, angostura orange bitter, jugo de limón amarillo), is served in vintage-looking stemware and garnished with a lemon peel. The cocktail has a heavier body than I anticipate. Still, it’s citrusy, bitter apple. A delight. It’s through Hanky Panky’s meticulous details that I’m transported from the casual graduer of Mexico City, into another world, possibly another era. American music streams at a conversational level; undercurrents of chatter in Farsi and French, among the Spanish and English, drift from the small lounge area. The booths, recessed, are the same tuffed red vinyl; intimately, they encircle marble tables. There are as many guests here as there are places to sit. 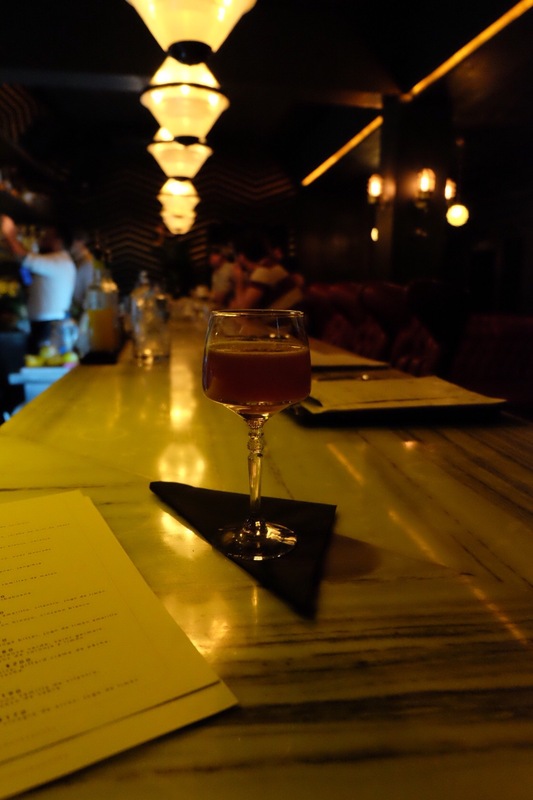 My second drink–El Luchador–elicits approval from the bartender and nearby guests. Earthy green flavor, followed by a kick of chile from the Ancho Reyes. 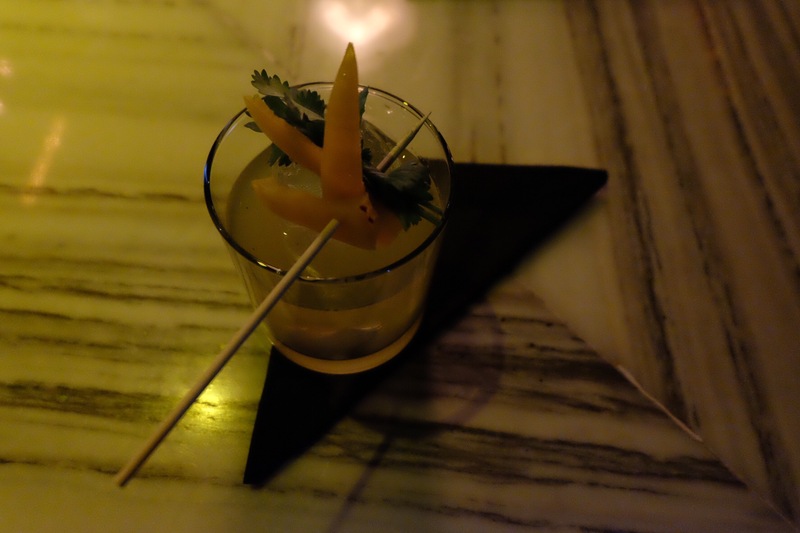 The sweetness of the bell pepper and cilantro tone down the mezcal’s smoke, making for a well-rounded libation. 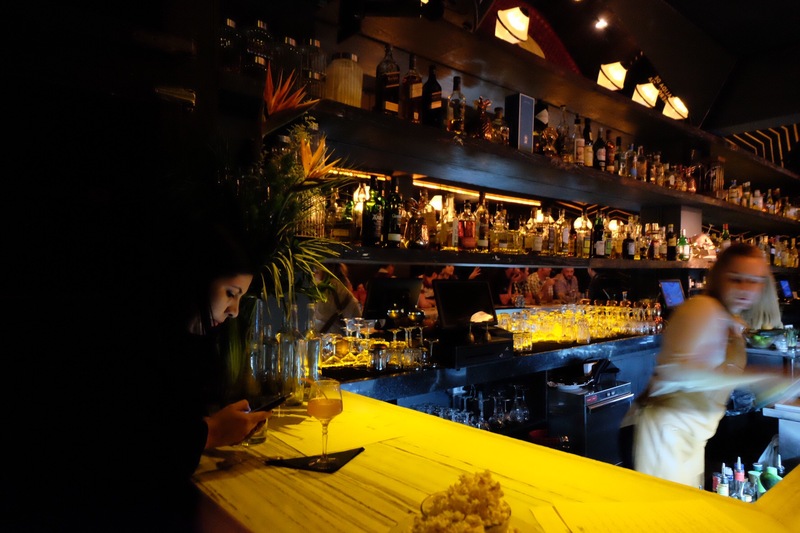 When I vascillate among options, another bartender takes me on a tour of his favorite agave spirit, raicilla. I’ve never had it before. He offers a sampling of three: Estancia (earthy minerality); Ocho Coyote (zesty citrus/ fruity); and Sotol Coyote Blanco (salt/ pepper). Each is easy going down. Hanky Panky’s owner is standing around nearby, photographing cocktails with the manager, casually chatting with me. The men suggest I have a Gibson with the Sotol; the salty undertones provide a perfect base for this savory classic. 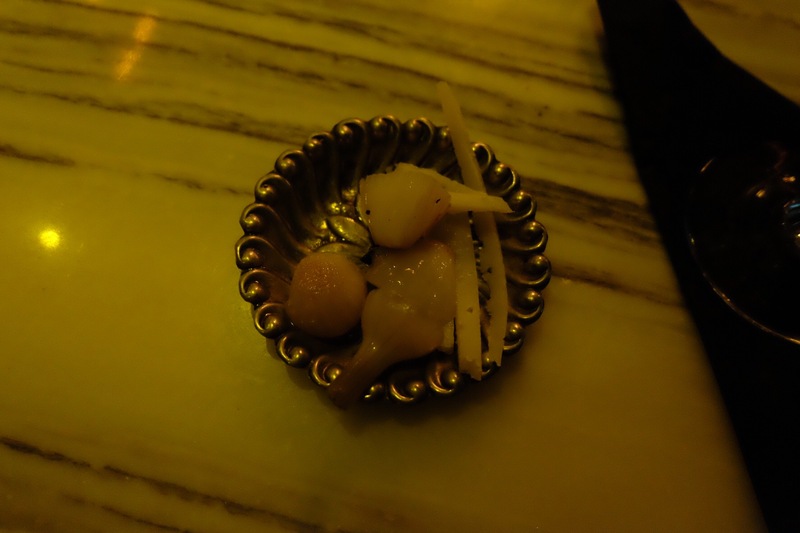 On the side are pickled onions and ginger. 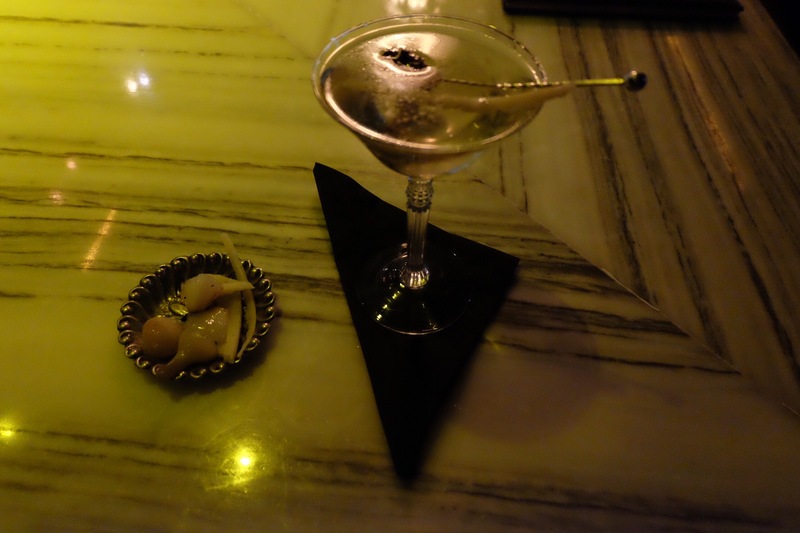 Later, as the night goes on, the owner offers me some floral concoction served up with a pansy. The Aviation (Beefeater 24 Gin, Luxardo Maraschino, creème de violette, lemon juice, simple) has a delicate flavor but finishes strong. It’s about that time that another guest invites me to join his party. I relocate to one of the booths in back, the dark red vinyl a comfortable enclosure for our animated conversation. Table service is friendly, efficient. When we leave, we’re ushered to an exit, oddly positioned between tables. This isn’t the way we first entered.